I'm going to be taken to a ball game! It's true that this is not necessarily my sort of thing, but what the hey. The sun has been shining, and I'm prepared to have a great time. Bepe had two tickets to the match, but his friend has had to fly back to Italy to attend a family funeral, and as all his other sports-enthusiast friends are working, well, he's invited me. 3) There's a rather cute player on the Welsh team called Leigh Halfpenny, which is one of the best names I've ever heard of. Of course, I want Ireland to win, but I'd also like to see some action from Leigh. No, wait. I don't mean that the way it sounds. Anyway, it's so nice of Bepe to invite me when I'm sure I'm the last person he'd really like to go with as I'm totally ignorant about sport in general and rugby in particular. It's so lovely weatherwise at the moment, I'm eating lunch outside most days. 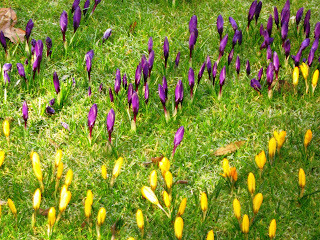 I took this picture on my phone today, of crocuses in Stephen's Green. I love these little guys; they look like candles and just seem so optimistic somehow. And flashy, without being pretentious. All-round good guys of the flower world.